Peter Pan: Don't you understand, Tink? You mean more to me than anything in this whole world! Captain Hook: [catching Mr. Smee leaving his cabin] And where do you think you are going? Mr. Smee: To tell the boys we sails with the tide, sir. Captain Hook: You will go ashore, pick up Tinker Bell, and bring her to me. Mr. Smee: [saluting Hook] Aye-aye sir! Mr. Smee: Well, at last, Captain Hook's comin' to his senses. Captain Hook: [surprised] Odd's fish! Mr. Smee: [to Tiger Lily] I told him all along you Indians wouldn't betray Peter Pan. Captain Hook: [sweetly] And just what do you think you are doing, Mr. Smee? Mr. Smee: Just what you told me, Captain: carrying out your orders. Captain Hook: [shoving Smee's rowboat back into Skull Rock] Put her back, you blithering idiot! Peter Pan: Second star to the right and straight on till morning. Lost Boy (Bear): I think I had a mother once. Lost Boy (Racoon): What was she like? Lost Boy (Bear): I forget. Lost Boy (Fox): I had a white rat. Lost Boy (Bear): That's no mother! Mr. Darling: [seeing the pirate ship floating in the sky back to Never Land] You know, I have the strangest feeling that I've seen that ship before. A long time ago, when I was very young. Mr. Smee: But Captain, we don't know where Peter Pan lives. Captain Hook: Great Scott, you're right, Smee! Captain Hook: What's that, my dear? You could show us the way? Why, I never thought of that. Captain Hook: Take this down, Smee. Mr. Smee: "Take this down, Smee." Aye-aye, Captain. Mr. Smee: [writing in the paper] "Start at Pegleg Point... "
Mr. Smee: [writing] "Blindman's Bluff... "
Captain Hook: Continue, my dear. Captain Hook: ... or a hook... on Peter Pan. Captain Hook: Ah, Hangman's Tree! So that's the entrance to his hiding place! Captain Hook: Thank you, me dear, you've been most helpful. Mr. Darling: "Now, George". "Now, George"! Well, "now, George" will have his say! Captain Hook: Yes, Miss Bell, Captain Hook admits defeat. Tomorrow, I leave the island, never to return. Mr. Smee: I'm glad to hear that, Captain. Captain Hook: [to Tinker Bell] And that's why I asked you over, me dear, to tell Peter I bear him no ill will. Oh, Pan has his faults, to be sure. Bringing that Wendy to the island, for instance. Dangerous business, that. Why, rumor has it that already she has come between you and Peter. Captain Hook: But what's this? Tears? Then it is true. Captain Hook: Oh, Smee, the way of a man with a maid: taking the best years of her life and then casting her aside like an old glove! Captain Hook: [handing a handkerchief to Tinker Bell] But we musn't judge Peter too harshly, my dear. It's that Wendy who's to blame. Captain Hook: Mr. Smee, we must save the lad from himself. But how? Captain Hook: We've so little time; we sail in the morning. Sail? That's it, Smee! Captain Hook: We'll shanghai Wendy! Mr. Smee: Shanghai Wendy, Captain? Captain Hook: Take her to sea with us. With her gone, Peter will soon forget this mad infatuation. John, Lost Boy (Bear), Lost Boy (Fox), Lost Boy (Racoon), Michael: How, Chief. How. Indian Chief: For many moons, red man fight paleface Lost Boys. John, Lost Boy (Bear), Lost Boy (Fox), Lost Boy (Racoon), Michael: Ugh. Indian Chief: Sometime, you win; sometime, we win. Lost Boy (Bear): Okay, Chief. You win this time. Now turn us loose. John: Turn us loose? You mean this is only a game? Lost Boy (Fox): Sure. When we win, we turn them loose. Lost Boy (Racoon): When they win, they turn us loose. Indian Chief: This time, no turnum loose. Lost Boy (Fox): The chief's a great spoofer! Indian Chief: Me no spoofum! Where you hide Princess Tiger Lily? Lost Boy (Bear): Uh, Tiger Lily? Lost Boy (Fox): We ain't got your ol' princess! John: I certainly have never seen her. Lost Boy (Racoon): Me neither. Indian Chief: Heap big lie! If Tiger Lily not back by sunset... burn 'um at stake. Wendy: You can't stick it on with soap, Peter. It needs sewing. That's the proper way to do it. Although, come to think of it, I've never thought about it before... um... sewing shadows, I mean. Squaw: Squaw get 'em firewood! Wendy: Squaw no get 'em firewood! Squaw go home! Wendy: What's the chief doing, John? John: He's giving an oration in sign language. John: He says... "Peter Pan... mighty warrior... save Tigerlily... make big chief... heap glad." Wendy: [jokingly] Well, he certainly doesn't look "heap glad". Mr. Smee: [referring to Neverland] This ain't no place for a respectable pirate. Captain Hook: So passes on a worthy opponent. Michael: [referring to Tinker Bell] Oh, look! A firefly! Michael: What's the pixie doing? Wendy: What did she say? Peter Pan: She says you're a big ugly girl! Wendy: Oh... well, I think she's lovely. Wendy: Oh! Mother, we're back! Wendy: All except the lost boys. They were not quite ready. Mr. Darling: Lost boys? Ready? Wendy: To grow up. That's why they went back to Neverland. Wendy: Uh... ready to grow up. Wendy: We had lots of fun with Tinker Bell, and the mermaids, and Peter Pan! Oh, he was the most wonderful person of them all! And then we called him a codfish! Wendy: Uh... Captain Hook, I mean. Wendy: And then... we sailed away on a ship in the sky. Mr. Darling: [weirded out by Wendy's story, yawns] Mary, I'm going to bed. Mrs. Darling: George, dear, do hurry. We mustn't be late for the party, you know. Narrator: Well... Mr. Darling was a practical man. Mr. Smee: [Catches Tinker Bell using his hat as a sack] Begging your pardon Miss Bell, but Captain Hook would like a word with you. Peter Pan: Well? Get on with it, girl! Wendy: My name is Wendy. Wendy Alora Fransisca Darling. Wendy: How did Nana get your shadow, Peter? Peter Pan: Chomped at me the other night at the window. Wendy: But what were you doing there? Peter Pan: I came to listen to your stories. Wendy: My stories? But they're all about you. Peter Pan: Of course! That's why I like 'em! Mr. Darling: Wendy, haven't I warned you? Stuffing the boys heads with a lot of silly stories? Wendy: Oh, but they aren't. Mr. Darling: I say they are. Captain Crook! Peter Pirate! Mr. Darling: Pan... Pirate... Poppycock! Mr. Smee: Shhhh! The Captain has a splitting headache. We mustn't annoy him. Mr. Smee: Well, Captain. It's nice to see you smiling again. Brings back the good old days when we was leading a healthy, normal life, scuttling ships, cutting throats. Mr. Smee: Oh Captain, why don't we go to sea again? Mr. Smee: ...that he heard... that Pan has banished Tinker Bell. Captain Hook: Did you say Pan has banished Tinker Bell? Captain Hook: Blast that Peter Pan! If I could only find his hideout, I'd trap him in his lair. But where is it? Captain Hook: Mermaid Lagoon? No, we've search that. And we've combed Cannibal Cove. Captain Hook: Here! No. No, no, no, that's Indian territ... But wait. Those redskins know this island better than I do me own ship. Ah, I wonder. Mr. Smee: [walking up] Good morning, Captain. Captain Hook: [grabbing Smee] I've got it! Tiger Lily, Smee! Captain Hook: The chief's daughter. She'll know where Pan is hiding. Captain Hook: Oh, a little persuasion might be in order. Now let me see... Boiling in oil? Uh, keelhauling? Eh, marooning? Mr. Darling: Dash it all, Nana, don't look at me like that. It's nothing personal, it's just that... well, you're not really a nurse at all, you're... well, a dog. And the children aren't puppies, they're people. And sooner or later, Nana, people have to grow up. Peter Pan: Mr. Smee! Just exactly what do you think you're doing? Mr. Smee: Putting her back like you said, Captain. Peter Pan: I said nothing of the sort! Peter Pan: For the last time, Mr. Smee, take the princess back to her people! Mr. Smee: Aye, aye, sir. Peter Pan: Oh, and one more thing. When you return to the ship, tell the whole crew to help themselves to me best rum. Mr. Starkey: No splash, Captain. Captain Hook: So, you want a splash, Mr Starkey? I'll give you a splash! Peter Pan: You're next, Hook! This time you've gone too far! Mr. Smee: Oh, dear, dear, dear, Captain Hook. Shooting a man in the middle of his cadenza? That ain't good form, you know. Captain Hook: "Good form," Mr. Smee? Captain Hook: Blast good form! Captain Hook: Did Pan show good form when he did this to me? Mr. Smee: Why, Captain, cutting your hand off was only a childish prank, you might say. Captain Hook: Aye, but throwing it to that crocodile! That cursed beast liked the taste of me so well he's followed me ever since, licking his chops for the rest of me. Mr. Smee: And he would've had you by now, Captain, if he hadn't swallowed that alarm clock. But now, when he's about, he'd warn you, as you might say, with his tick-tock, tick-tock, tick-tock. Peter Pan: What a pity, Mr Smee. I'm afraid we've lost the dear Captain. Peter Pan: Well, well, a codfish on a hook. Captain Hook: I'll get you for this, Pan, if it's the last thing I do! Captain Hook: [about to lower a bomb into Peter Pan's hideout] And now, Smee, to take care of master Peter Pan. Mr. Smee: But, Captain, wouldn't it be more humane-like to slit his throat? Peter Pan: Now you try. Wendy: I'll think of a mermaid lagoon, underneath a magic moon. John: I'll think I'm in a pirate's cave. Michael: I think I'll be an Indian brave. Peter Pan: Now everybody try. Wendy, John, Michael, Peter Pan: One, two, three! Wendy, John, Michael: We can fly! We can fly! We can fly! Peter Pan: This won't do. What's the matter with you? All it takes is faith and trust. Oh! And something I forgot. Peter Pan: Yep, just a little bit of pixie dust. Peter Pan: Now, think of the happiest things. It's the same as having wings. Peter Pan: I say, Captain, do you hear something? Mrs. Darling: But, George, do you think the children will be safe without Nana? Mr. Darling: Safe? Of course they'll be safe. Why not? Mr. Darling: Shadow? Whose shadow? Mr. Darling: Oh, Peter Pan... Peter Pan! You don't say! Mr. Darling: [high, mocking voice] Goodness gracious, whatever shall we do? Mr. Darling: Sound the alarm! Mr. Darling: Call Scotland Yard! 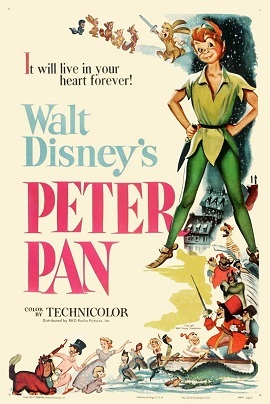 Peter Pan: [as he and Capt. Hook hear the sound of Tick-Tock] I say, Captain, do you hear something? Captain Hook: [trembles in fear] No. Captain Hook: Fly! Fly! Fly! You coward! Captain Hook: Ha-ha-ha! You wouldn't dare fight old Hook man-to-man. You'd fly away like a cowardly sparrow! Peter Pan: Nobody calls Pan a coward and lives! I'll fight you man-to-man, with one hand behind my back. Captain Hook: You mean you won't fly? Wendy: No, don't, Peter! It's a trick! Peter Pan: I give my word, Hook. Captain Hook: Good, then let's have at it! Captain Hook: I've waited years for this. Mr. Smee: That's not countin' the holidays, either. Peter Pan: It's easy! All you have to do is to... is to... is to... Ha! That's funny. Wendy: What's the matter? Don't you know? Peter Pan: Oh, sure. It's... It's just that I never thought about it before. Say, that's it! You think of a wonderful thought. Captain Hook: A jealous female can be tricked into anything. Peter Pan: Well, I'm certainly proud of you... you blockheads! Peter Pan: Mr. Crocodile, do you like codfish? Narrator: All this has happened before, and it will all happen again. But this time it happened in London. It happened on a quiet street in Bloomsbury. That corner house over there is the home of the Darling family. And Peter Pan chose this particular house because there were people here who believed in him. Captain Hook: You wouldn't do ol' Hook in now, would you, lad? I'll go away forever. Captain Hook: I'll do anything you say. Peter Pan: Well, all right... if you... say you're a codfish. Captain Hook: [gulps] I'm a codfish. Captain Hook: [wailing] I'M A CODFISH! John: [as Captain Hook] Blast you, Peter Pan! Michael: [as Peter Pan] Take that! Give up, Captain Hook? You give up? John: Never! I'll teach you to cut off me hand! Wendy: [coming in; chuckling] Oh, no, John, it was the left hand. John: Oh, yes. Thank you, Wendy. Peter Pan: Girls talk too much!